The Sustainable Development Goals (SDGs) set ambitious targets to build a more sustainable, safe, & prosperous world for all humanity by 2030. How do you want them implemented on your campus, in your community, & throughout the country? Contribute your thoughts at www.sdgtownhall.ca. The Sustainable Development Goals (SDGs) set ambitious targets to build a more sustainable, safe, & prosperous world for all humanity by 2030. How do you want them implemented on your campus, in your community, & throughout the country? Join students from universities & colleges across Canada to contribute your thoughts at www.sdgtownhall.ca. Learn more about the SDGs and test your knowledge with the SDG Geek quiz. 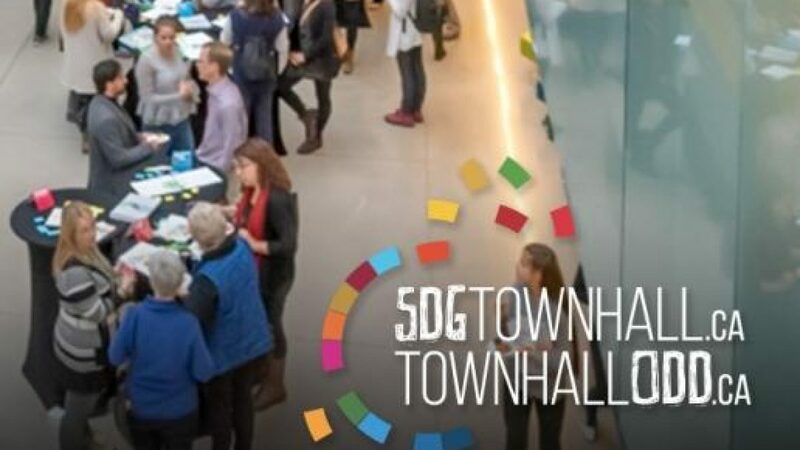 The SDG Town Hall will work to develop policy recommendations for the Government of Canada as they develop a National Strategy for the implementation of the SDGs and will also inform future directions on how best to support a post-secondary ecosystem for student-led activation around the SDGs. For more information, please visit www.sdgtownhall.ca. This project is a collaboration between the Sustainable Development Solutions Network of Canada (SDSN Canada), the Waterloo Global Science Initiative, TakingITGlobal, and the Youth Climate Lab. The project is funded in part by the Government of Canada’s Sustainable Development Goals Program.